Through GVLC’s Mission & Vision values Connect, Teach, and Share, the Children & Families Ministry is committed to leading families into a growing relationship with Jesus Christ. 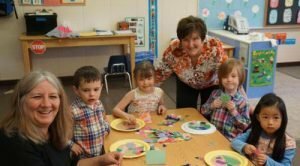 Sunday School meets weekly September through May for children age three to grade five. A typical day includes large group interactive praise and worship, creatively-taught Bible lessons, engaging activities, and prayer. Each of our programs is designed with each age group in mind and a commitment to friendship and fun – all in a safe environment with caring, trained staff and volunteers. Kids will learn through drama, music, arts and crafts, reading books and the Bible, games, and discussion. GVLC is a church that welcomes all families and children to join our worship time. 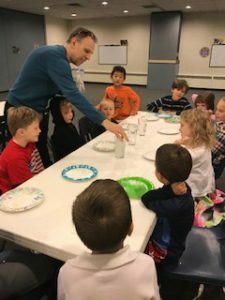 Children are invited and encouraged to attend worship; however, a staffed nursery is available for those times when children need more activity. The nursery is open during all worship services, Sunday morning education hour, and during adult or parenting classes with caring staff that have completed a background check and interview process and are first-aid, AED, and CPR trained. This fun, annual event takes place the Saturday before Easter and includes an Easter egg hunt, pony rides, petting zoo, crafts, pictures with the Easter bunny, and more. This is a free event open to all families with children age three to grade five. This week-long extravaganza takes place every summer and is open to children age three to those entering grade six. Join us as we transform our Sanctuary and hallways to create a spiritually-engaging environment to help kids grow in their faith. Each generation has unique characteristics, attitudes, values, and beliefs that influence how they view the world. Significant life events can also influence and shape each generation. Gen Z, those born between 1995-2012, is growing up in what is considered the first truly post-Christian generation. So what does that mean for parents, families, and society as they are raising their children? Join us for a discussion to learn more about Gen Z, their beliefs, attitudes, and characteristics and also how Christian parents can influence the next generation of children. Jen Hall, GVLC Director of Family Ministries, will present followed by small group discussion. Free . Go to the Classes page to signup. For more information on any of GVLC’s Children & Family activities, please contact our Director of Family Ministries, Jennifer Hall at 763.544.2810 X12, or at familyministry@gvlc.net. He called a little child to him, and placed the child among them. And he said: “Truly I tell you, unless you change and become like little children, you will never enter the kingdom of heaven. Therefore, whoever takes the lowly position of this child is the greatest in the kingdom of heaven. And whoever welcomes one such child in my name welcomes me.